PES alums from Bauer are on Hilti fast track. Top students who are accepted into the Program for Excellence in Selling at UH C. T. Bauer College of Business don’t typically have a vision of themselves brokering tools. Most have set their sights on earning a top salary as quickly as they can. To many, that means a career in pharmaceutical sales or some other high-profile field, says Carl Herman, Executive Professor and Director of Partner Relations at Bauer’s Sales Excellence Institute (SEI). But SEI instructors encourage students to be open-minded about career possibilities and to try and identify a company that truly suits them, Herman says. And several who have been willing to do that have found rewarding careers at Hilti, a leading supplier of industrial construction supplies and one of the largest privately held companies in the world, headquartered in Germany. “They (Hilti) have risen to the top as one of our best (corporate) partners and they get some of the very best students,” Herman says. Each of the PES students hired to work at Hilti in the last five years has risen quickly and been promoted, Herman says. Although the students typically arrive on the job with plenty to learn about the construction supply business and Hilti’s role in it, “their sales training gives them a head start,” Herman says. All have been positive about how multi-faceted their jobs are: They might wear a suit and tie for a visit to a senior executive’s office one day, and don a hardhat for an on-site consultation with a construction foreman, the next. 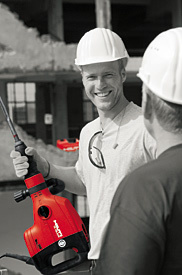 They also like that Hilti is a company that values long-term client relationships. John Guttery (MBA, ’98), senior vice president at Hilti North America, says he was eager to help link Hilti’s rapidly growing direct marketing and sales organization with Bauer’s PES program. PES is one of three programs within SEI. It is the largest sales undergraduate program in the U.S., and it also carries the distinction of being the only institution to offer a Certificate in Selling to graduate students, Herman says. Bauer is the leading institution for sales research in the U.S., he says, which contributes yet another layer of regard for PES and its students. While other schools offer a major in Sales, Bauer’s program is built upon the belief that students are better prepared for their careers when a minor in Sales is combined with another primary field of study, Herman says. Corporations, who are looking for both quantity and quality when it comes to prospective job candidates, agree with that focus, Herman says. And Hilti, with its history of rapidly promoting PES graduates, Herman says, is one of many success stories – for both the corporation and the students.